Ain't it purty? 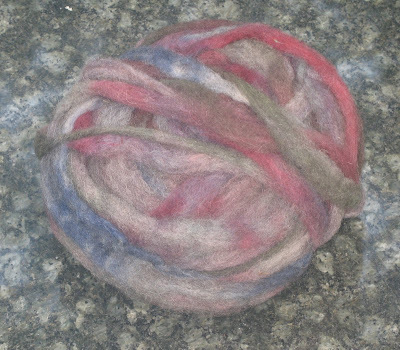 This was dyed using a sampling of Ray's favorite color mixes applied to natural Jacob's sheep grey pencil roving. Because it is pencil roving, the yarn, once spun up, retained the color repeats rather close to the way Ray laid them out. This was Ray's first attempt at dyeing roving and I have to give him a hand; he instinctively knew how to space the roving so that a bit of grey showed in between color repeats without being muted out by the color. The photo above was taken in natural light on an overcast day and is about 95% true to the actual color of the roving. It can be tricky getting true color on an overcast day. Oh, and ..? Slap me with the stupid stick. I didn't include an object for size reference, so I should add that this very fluffy and squishy ball of roving is about the size of a small adult-sized hat, or a loaf of sourdough bread. Weight: 1.8 US ounces of fiber. Now if I had wanted, I could have Navajo-plied to retain the color sequence and saturation showed above ... or, I could have retained the color sequence and created a muted color segue by plying it with either a solid grey or a solid white single. But the yarn told me it would rather have a tweedy appearance, so I plied it against itself, making no attempt to match color sequencing. 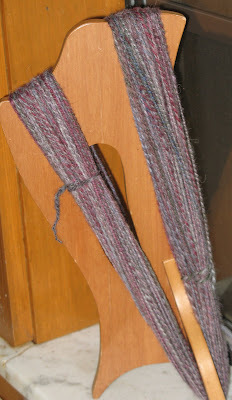 The result is a mix of barber-pole effect and matched-color bits as they happen to fall in the plying. Like I told Ray, something about these colors made me think Victorian thoughts ... thoughts which lingered in shadowed parlors draped with ruby silk and midnight blue velvet ... the surf pounding on the grey cliffs outside ... and into this parlor wanders Edgar Allen Poe. Ray, this is a great colorway for handspinning, and I hereby christen it, "Annabelle Lee." by the name of Annebelle Lee. than to spin and make yarn for me..."
9:00 PM update: Folks, please keep your thoughts on the poor folks in Jamaica -- they are getting the worst quadrant of the storm as I write this. The Yucatan is next, and the storm will have strengthened to Category Five by the time it hits Mexico. Cancun is still in shatters from the 2005 storm season. This is a good time of year to donate to your favorite disaster relief charity. It's gorgeous - I could also see it as a cushy shoulder shawl - perfect for reading by the fire in the winter. Ya think? 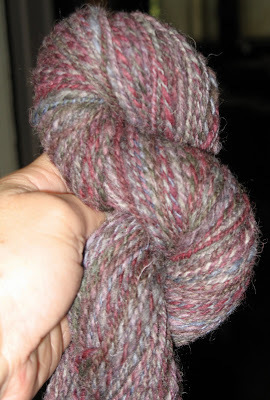 What lovely roving, turned into lovely yarn! I agree that there's something about it that evokes a Victorian feel. Beautiful work. Beautiful! The fiber and the yarn, both. There is definitely something evocative of a Victorian Tea Parlor or something in the colors. I'm grateful for what you made of it. And I LOVE the name you've given it. "Annabelle Lee". 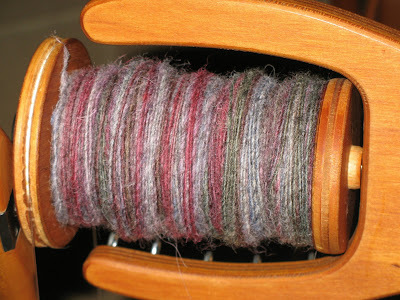 Beautiful work, and your spinning looks so even, makes me aspire to another round of it at this end. thinking of you, dez. have to show these fine photos to spinning spouse...did he know this about color and pencil roving, i'm asking.